Today’s surveyor photo shows the tell tale signs of a woodworm infestation. It was taken by a Timberwise surveyor whilst surveying the loft of a property in Chester that was having a positive pressure ventilation system installed. Our eagle eyed surveyor spotted the tell tale signs of frass (a fine powdery like material that is the waste product of the woodworm) on some of the owners belongings that were stored in the loft space. This gave an indication of a possible woodworm infestation. Although it is common to see holes left behind by woodworm from previous infestations it is always worth seeking the opinion of a woodworm specialist to see if the infestation is current and needs treatment or not. 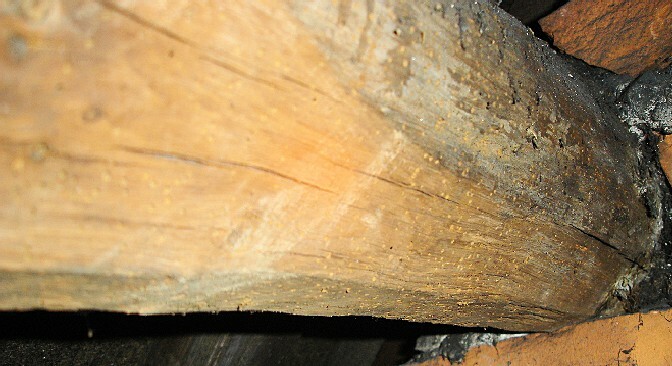 In this case the surveyor also found some live woodworm indicating that the infestation was active. The photo above shows one of the purlins in the roof where exit holes from the woodworm are clearly visible. We are now in the woodworm flight season (this runs roughly in the warmer months say May to September) and it is now that the woodworm are “coming out of the wood work” so to speak! For people who are interested in further information about woodworm we have a document written by our “Woodworm Expert” available for free as well as a woodworm video podcast looking in detail at the life cycle of woodworm. Timberwise have been treating woodworm problems for over 40 years and our highly skilled surveyors will be able to advise you on the nature of the woodworm infestation within the property. To arrange a woodworm survey call 0800 288 8660 or complete our woodworm survey request form. Would suggest possibly dry rot spores, why were the original repairs undertaken, what sort of rot was it? Would suggest that you need to get a specialist inspection as soon as possible!